Today was almost a carbon copy of yesterday. We only had to do 18mi to get to the hitch point down at the Colorado River. We had 16 more miles on the Tonto West trail and it was much of the same. 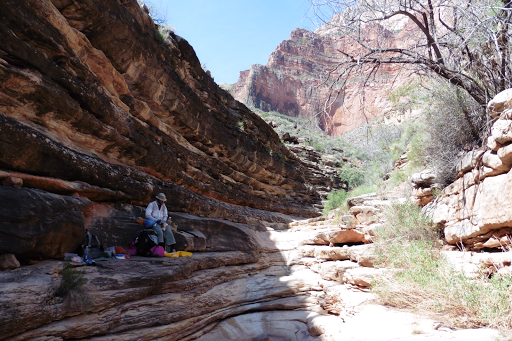 A somewhat faint and winding trail that went in and out of “Gem” side canyons, heat, a breeze at times, heavy packs, and average sized water carries. We met a hiker coming from the opposite direction and he was able to give us a heads up on the water sources ahead, so that was a relief. We had lunch at the one source of the day and we’re excited to see that it was in a pour off that was shaded. The rock we sat on was even cool! So 16mi into the day, we came to the S Bass Trail, which would take us down to the Colorado River. We figured we were too late for the hitch and would have to wait til tomorrow, but did see a group of four headed down with oars. I got my hopes up to find that it was a beginner group with a guide and all had solo boats, so no hope for a hitch, dang. 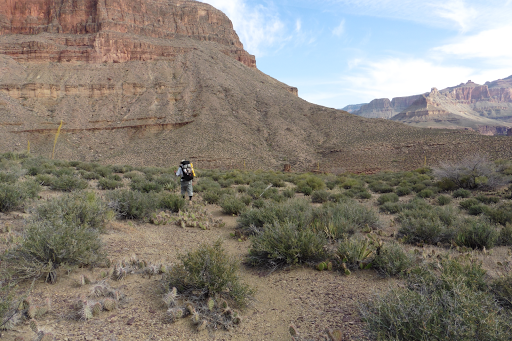 The trail was up high on the cliffs along the Colorado River with many routes and cairned routes to choose from to go down to the river. Li wasn’t 100% sure of the best place to hitch and said we might have to search a bit. His track has you going down a cairned route above Bass Rapids. The backpacker we met earlier said he had camped on a beach across from a beach boaters stopped at for lunch. We couldn’t decide if we should set up camp above or below the rapids. We saw that there was a small beach further down river, below the rapids, with boats there. 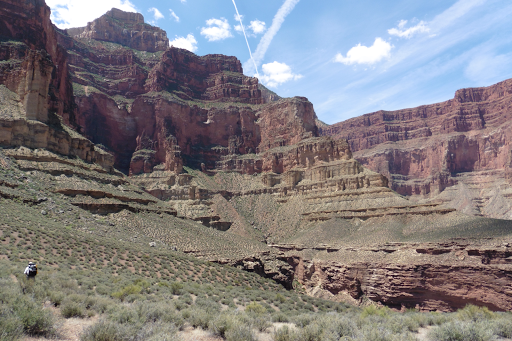 We hiked along the cliffs for what felt like longer than it really was until we were above the boaters, but we couldn’t find a path or safe way down the cliffs that far down river. We gave up on that idea and walked back going down two other routes to investigate options. At least it was 5pm when we arrived, so we had time to burn. We ended up going down to a small cove where the guided group was inflating their solo rafts. The guide commented that the water is quite high and that he hasn’t seen the Colorado so high before. He also told us that Bass Beach, above Bass Rapids would be our best bet for camping and hitching in the morning. By the time we got there, I was pretty spent and cranky still dealing with the regular exhaustion of hiking in heat with a heavy pack and the double whammy of the exhaustion my period brings. I was not a happy camper. When we finally got to our camp spot, we could see that about 100yds up river, a commercial raft with a large group of campers were set up across the river. I was able to bushwhack half the distance to that beach and waited for someone to come nearer to the shore closer to our beach. When they did, I was able to yell across and ask about a morning hitch. They kindly agreed to pick us up on their way by in the morning by 8 or 8:30(7:30am for them since we are sticking to Utah time). Perfect! We get to sleep in an hour and have a hitch arranged with a commercial boat group and will get to go over the Bass Rapids, yay! A great end to a tiring and monotonous day. Well, it was a great end until I did my camp routine…not my day. With how tired I feel the first couple days of my period, everything feels like it takes double the effort and my reflexes are pretty slow. It took me awhile to do my camp routine and lots went wrong. When I got water, I noticed my 2L Sawyer bag had tons of holes squirting out water, presumably from brushing or leaning my pack against a cactus since I keep the bags in an exterior pocket. Good thing I have bonus bags, but all have some kind of repaired hole or slow leak I can accept for the rest of this trip. Another problem was that I didn’t notice my alcohol stove was smashed a bit, so it lowered the power of the burn and my Mac & Cheese was more like Mush & Cheese. I had to let it burn and cool before I could fix the little pop can contraption, by stretching it back out to allow more oxygen to flow through it. Then I had to add more fuel…I have very little to spare and have to ration it on long legs like this. I now might be short on fuel and unable to cook the final night of the leg if I’m not careful. In all this, I then managed to burn a layer of Mush & Cheese to the bottom of the pot. I now have the added pack weight of half a cup of burnt Mush and Cheese in my trash bag. Cleaning the pot and getting the black charred pasta off the bottom took forever. Yep, not my night. It is a beautiful camp spot though! 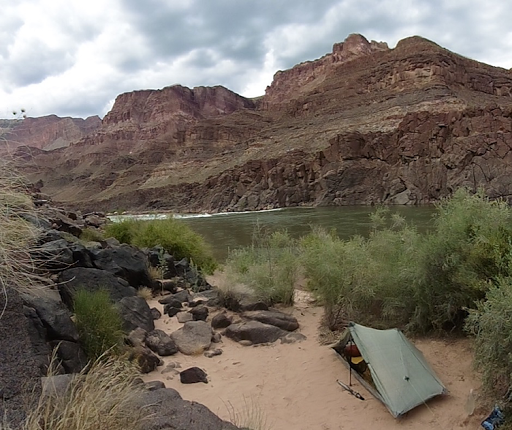 A nice beached area and the white noise of the rapids to give me a great night of sleep. Now that we are much lower, it’s even warmer and it’s 80F in my tent. It’s ok, but I’m wearing as little as possible and still sweating and sticking to my sleeping pad and sleeping bag, which I’ve now just pushed off to the side.